Tom and I have been outside doing all those little jobs that we've been putting off. Our hot, humid weather isn't that far away so you just gotta take advantage of this wonderful weather. Take a little walk around your yard with a pad of paper and a pencil and make a list of things that you can do to make your outside living area even more exciting and beautiful. If the weather hasn't given you enough inspiration......all you need to do is visit your favorite garden center and see all the tempting flowers that are available. 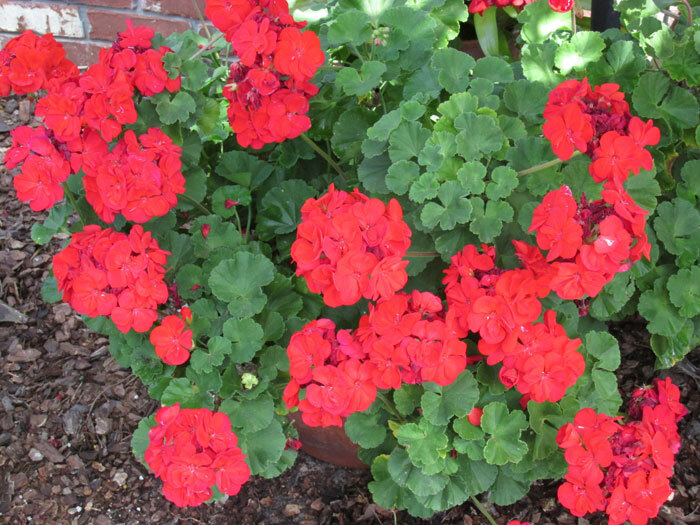 A few choices that you can plant right now for the sun are Geraniums, Gaillardia, Marigolds, Salvia, Torenia, Verbena, Salvia or Zinnias. And if you've never tried Dahlias or thought they were only for 'up north'......give them a try. Ours did great last spring and they flowered well into the fall months. Have you thought about adding a few landscape timbers to your yard? We enclosed a few areas of our yard last weekend and it sure looks good. They are the perfect thing to enclose a flower garden...... maybe an area that you'd like to accent........or to even make gardening a little easier. If you have a nice defined edge for your gardens, it's a lot easier to keep weeds or wandering turf from invading your garden. It will also keep mulch where you wanted it. Landscape timbers last a long time and are worth the investment. Try stacking a few timbers to create a raised bed vegetable garden. It will make caring for your plants at lot easier on your back and harvesting the results will be a lot more relaxing. Another thing we've been doing is cleaning up our previously used pots and garden tools. The best way to clean those yukky pots is by soaking them in a container of water with a little bleach added. This will kill any problems that may still be lurking in them. Also those garden tools may need a little cleaning too .....dip them in a little bleach solution....dry them and add a little oil to their hinges to keep them working their best. It's a good thing to do this often to prevent problems from passing from one plant to another. And finally invest in a little red wagon. Stock it with your favorite tools and take it with you as you work around the yard.